As our population ages, more and more family members are caring for parents, grandparents and siblings with dementia or Alzheimer’s disease. They take on responsibilities that they aren’t trained for. They do the best the can. And, often, they suffer irreversible health consequences as a result of the stress they are under. The Alzheimer’s Foundation of America estimates that more than five million Americans have Alzheimer’s disease. This number is only going to increase until a cure is found. The population of Americans over the age of 65 is going to double in the next 30 years, so until there is a cure, the number of people suffering from dementia and Alzheimer’s is also going to increase. We need to start thinking of how this impacts families and what kind of support mechanisms we can put in place for caregivers. The Foundation estimates that it takes up to four family members to care for one person with Alzheimer’s. The plight of caregivers goes largely unrecognized. The Alzheimer’s Association estimates that 15 million Americans provide unpaid care for family members with Alzheimer’s or other forms of dementia. Not only does the care they provide take a physical and emotional toll, but the financial consequences can be staggering. Two-thirds of those providing care are women and more than 30 percent of them are 65 years old, or older. Another quarter of caregivers is caring for a parent or grandparent while still caring for children under 18 years old. There are places to turn for help. If you have a family member who is in the early stages of the disease, be sure you are planning for the future. Making sure they are in a stable living environment where the level of care they need can be adjusted as their needs change, is one of the most important things you can do as a caregiver, or to support the caregiver in your family. Talk to your family members about plans for the future and make sure you all agree on what steps to take, and when to take them. The 24/7 Alzheimer’s Association helpline (1.800.272.3900) is a great place to reach out. They can help you with urgent needs. And, they’ve got a network of caregiver support services throughout the country. You aren’t just a caregiver. Remember that. Take care of yourself. Keep an eye out for these indicators of severe stress that the Alzheimer’s Association has identified. And, if you have any of them, reach out to your doctor or the Association for help right away. You feel like whatever you do, it is never enough. You’ve withdrawn from family, friends and all other activities. You are constantly anxious about money and healthcare. You are in denial about how serious the situation is. You frequently get angry with, and lash out at, the person you are caring for. You have health problems that you are neglecting. We are also here to help. 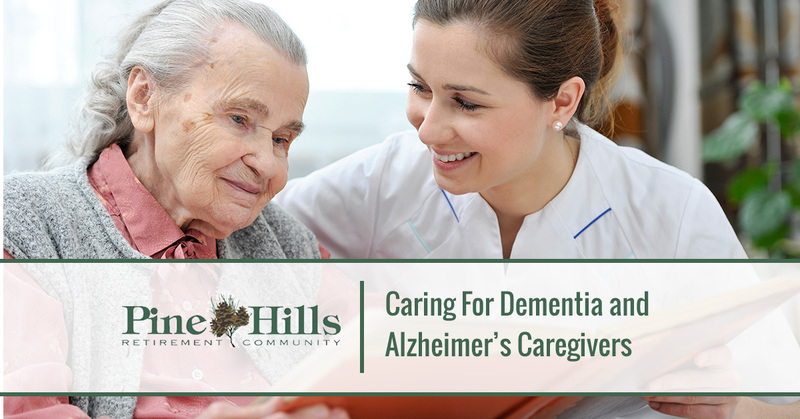 The Pine Hills Memory Care Center is a first-class care facility that ensures the safety and well-being of your loved ones. Give us a call. We are here to serve your needs and those of your loved ones.